Please see the message from Patriot below. apologized to the board and we apologize to you the residents. tomorrow and continue with that schedule moving forward. We are committed to making sure our Woodstream residents receive the best possible services at all times. Recently we have needed to change our trash collecting company. Our new company, Patriot Disposal, is a locally owned and operated family business and has been in the Northern VA area since 2007. There will be NO trash pick-up this Friday, February 1st, 2019. Residents are asked to refrain from putting any cans or bags at the curb on this day. Recycling will be picked as scheduled up on Wednesday, January 30th. Yard waste will be picked up March through December on Wednesdays. Recycling will no longer be picked up on Wednesday. 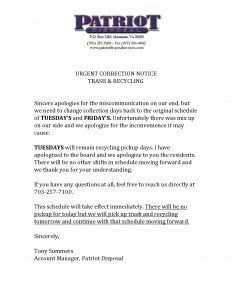 Since recycling and trash pick-up will now be collected on the same day, residents are asked to please separate the trash from the recycling on Tuesdays. New recycling bins will be provided by the trash company. Please put your house number on these bins. 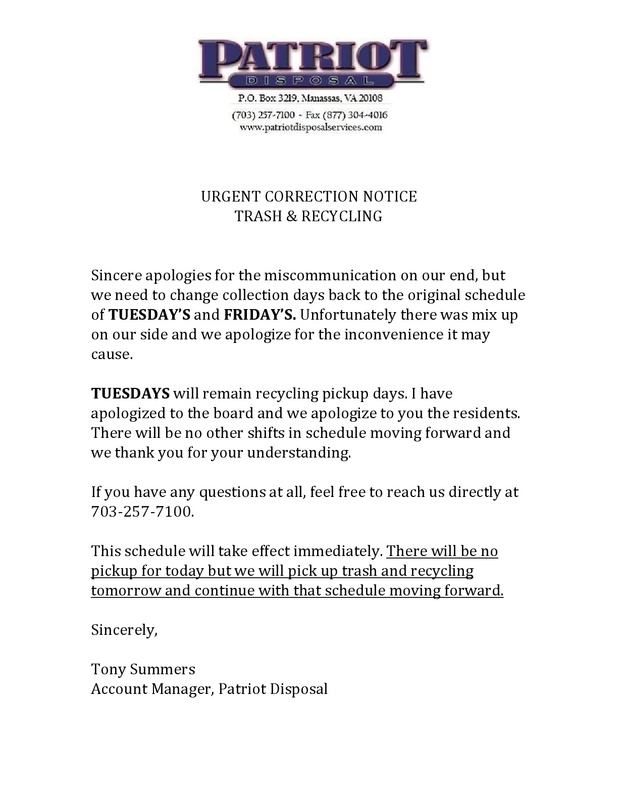 Patriot will be providing us more information in the coming days regarding acceptable items and contact numbers for bulk pick up and service issues. As a reminder yard was collection has ended until March. Yard debris is collected March through the end of December every year. The board was notified this morning that our trash provider Waste Management has sold our contract to another provider effective 1/1/19. We have been in contact with the new provider and have been fighting to get service for today 1/2. They informed us they should be in the neighborhood in the next 1 1/2 hours. During this transition there will more than likely be disruptions to our service. Please be patient as we try to restore service to an acceptable level. The new provider said we should put Christmas Trees out with regular trash. Fairfax County code dictates Christmas Trees are accepted the first two weeks of January. Yard waste collection has ended until March as per usual for the neighborhood. The board has no faith in the service the new contractor will provide. We are actively searching for new contractors and are working with our lawyers to terminate our current contract. We currently have one bid and are waiting on the numbers from two others. Please continue to monitor the HOA website. wooodstream.org for any updates. The curbside loose leaf pickup will be the week of November 18th, weather permitting. Please rake the leaves to the curb. No bagged leaves. Bagged leaves are taken by the trash service.